Born in Great Yeldham, Essex, the son of Revd. Francis Merewether MA in 1823, Charles Merewether was admitted to Wadham College, Cambridge, in 1840 and graduated BA in 1845, but did not proceed to MA. Instead he went into the law and was admitted as a Barrister in the Inner Temple in 1848, taking up Chambers in Paper Buildings, The Temple, which he seems to have retained for the rest of his life, becoming a Queen’s Counsel in 1877. 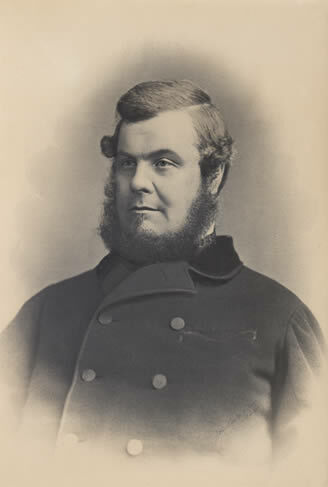 His connection with Leicestershire seems to have been through his father who was Vicar of Coleorton in north-west Leicestershire by 1841, holding the Living jointly with that of nearby Whitwick by 1855, and he was still the Incumbent at Coleorton in 1862. Charles Merewether (“of Wadham College Oxford”) was a Subscriber to J.P. Potter’s History and Antiquities of Charnwood Forest published in 1842, and the 1873 Return of Owners of Land shows that at that date he owned 60 acres of land in Whitwick with an estimated gross rental value of £45 a year, either inherited from his father or bought as an investment. Merewether was appointed Recorder of Leicester in 1868 and continued in that office after he was elected as a Conservative Member of Parliament for Northampton in a by-election in 1874. He left Parliament at the 1880 election when very controversially Charles Bradlaugh, a strong Secularist, was elected but then disqualified for refusing to take the Oath. After the death of his father, Revd. Francis Merewether, he commissioned a memorial stained glass window for him in Coleorton Church, and after his own death in 1884 in the St Giles parish of central London (i.e. presumably in his Temple apartments) a further new window was installed in the Church in memory of Charles Merewether. Main sources: R.B. Gardiner, 1895. Registers of Wadham College, Oxford, vol. 2. (Oxford); Pigot’s Leicestershire and Rutland Directory 1841; Kelly’s Post Office Directory for Leicestershire 1855; Slater’s Leicestershire Directory 1862; UK Census and Registration records.